A new version of iCurrency Plus for Windows desktop with Snarl integration is currently under development, and it will be released soon. This is just a sneak peek. 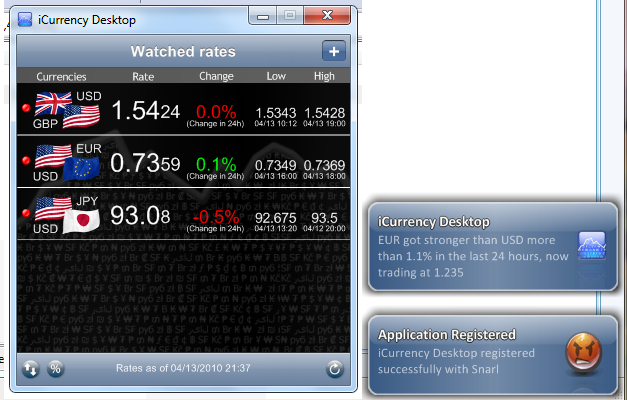 As you can see the interface is very similar to the one found in the iPhone application; but you have to wait to see what happens when a currency pair is selected (clicked). Notifications will be delivered via System popups, but if you have Snarl installed integration to this awesome interface is already done (like in the sample). This is one of the so many announcements we have for our three months anniversary, which is just in a two days. We enjoy the good news, we hope you enjoy it to. We broke all records yesterday! 1300+ new users downloaded the application in the first 24 hours after we put it free. Our user count is over 9000 at the moment. We also got almost 5000 application launches during the same time frame (we know the number of requests to the server; almost 60,000 requests in the first 24 hours, that is almost one request every second). All that traffic was generated by a unique group of 2500 users, so in average people launch the app twice a day! We have been wow’ed by your support and we really appreciate that!